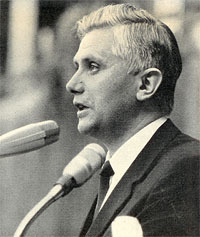 It is pretty much a commonplace today that at the time of the Council Fr Josef Ratzinger was to be counted among the conciliar young turks, channeling the Rhine into the Tiber, a progressive, if not so radical as his colleague Küng. In the wake of the student unrest and riots of 1968, the narrative continues, Ratzinger changed, seeing the dangers of radical progressivism and turned back to safer waters. His growing conservatism combined with his conciliar pedigree and obvious theological gifts led him first to be elected Archbishop of Munich and then appointed to head the Holy Office, God’s rottweiler as he was labeled by his detractors. There is little doubt that 1968 seems to have been something of a watershed year for Ratzinger. So it was something of a surprise to come across the text of a lecture Ratzinger gave at Bamberg’s Katholikentag in 1966. Here is a conflicted Ratzinger. The Council is barely a year over, and the student unrest of 1968 is still to come. Yet Ratzinger already senses danger, and senses too that the implementation of the Council’s decrees is more and more losing touch with the Council itself. Though it was printed in English in The Furrow of January 1967 as “Catholicism After the Council”, the German focus of Ratzinger’s paper may have caused anglophone students to put it to one side as being of more local-historical interest. Yet anyone who reads it would be struck by its prophetic nature, and the challenges he poses both to traditionalists and progressives alike. Maybe this too has made it inconvenient for most. Since I am unsure of its copyright status, the paper will not be reproduced or made available in full here. Still it is such a remarkable piece of Ratzinger, accessible to non-theologians, and with abiding relevance as we come to 50 years since the Council, that it seems reasonable to examine it to some degree. His talk will be dealt with in three parts. Herewith, the first. Ratzinger begins by defining his terms, focusing on the term ‘Catholicism’. He notes that at this period Catholicism had been reduced by many to yet another -ism, an ideology that blends “the ideal and the real in the life and society of our time… [while also] blurring the boundaries between them” (p.3). In this reorientation of the concept of Catholicism he finds that the Church “has yielded to the insistence of our age on arranging everything according to ideologies” (ibid.). As a result Catholicism has become no less constrained and constricted by worldliness than it was in the mediæval period, and is in fact “a continuation in a slightly altered form of the fusion, much criticised nowadays, between Church and society in the imperium Christianum of the Middle Ages”. That Ratzinger starts his paper in this way suggests not only that he has discerned in the contemporary Church a turn to the world that is at the same time becoming an accommodation to it. In light of what will follow, he seems to be warning the post-conciliar Church that its new engagement with the world risks not so much its influencing the world but the world influencing it. Even so soon after the Council, this new trajectory in the life of the Church was having unintended effects. To simplify things rather crudely, and to read between the lines, it is as if Ratzinger identified with the former tendency, a spirit in which the Council was convoked, and has found that the latter tendency has replaced it by the end of the Council. He intuits that the implementation of the conciliar decrees will be far more important than the Council itself. This summary sketch of the two opposing poles of post-conciliar opinion serves as well today as it did for Ratzinger in 1966. It is the latter opinion that Ratzinger seems more interested in, and to some degree more sympathetic towards. Those who view with alarm the post-conciliar reforms, as enacted, “compare this reform… with the reforms of past times, as for instance with that reform which is linked with the name of the great St Teresa.” (ibid.) Ratzinger is applying here what he later, as Pope Benedict XVI, would call the hermeneutic of continuity, which is the interpretation of developments in Church teaching and practice in the light of previous teaching and practice, since they should all share one organic and discernible unity. Dare it be said, but this could be a description of many monasteries of today, declining as they are, forces for reform though they were. Ratzinger is casting doubt upon the validity of two predominant yardsticks of reform in his day as well as our own: modernity and the ‘world’, following the example of St Teresa. Even allowing that he might be using some rhetorical flourish in his description of St Teresa’s situation, it is remarkable that he uses the totemic conciliar word, aggiornamento. 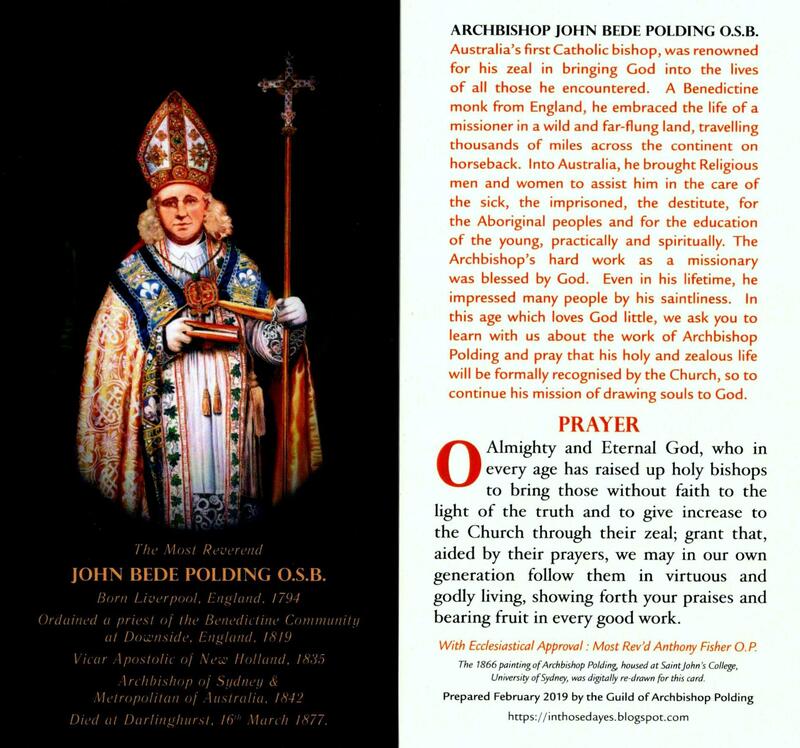 Until recently, in anglophone Catholicism especially, it has been a de facto dogma that aggiornamento, or updating, was both necessary and wonderful. It is effectively the conciliar motto for the progressive element. That Ratzinger, a progressive himself, so early is casting a shadow of doubt on the principle gives one pause for thought. For him, as for St Teresa, the demands and challenges of the Gospel cannot be updated, only diluted and discarded. Any ecclesial reform that weakens the Gospel call in such a way is no reform, but deformation. Shifting our gaze back to the present day, we see how right and how prescient was his concern. That within the Church, among her pastors and teachers, can be found those who explicitly contradict magisterial and biblical teaching on sexuality and marriage, the sacredness of human life, the priestly office, et al., can be traced precisely to the influence of the two sources for the call to change that Ratzinger warns against, namely modernity and the world. These people seek “carte blanche to continue in their worldly ways”. They seek, indeed, for the Church to accommodate and to validate their pursuit of self as their highest good, and their consequent avoidance of the Cross. In place of Christian freedom, they want liberty without responsibility. In place of the demands of love, they want only the approbation of lust and the avoidance of its consequences. So, back to Raztinger. 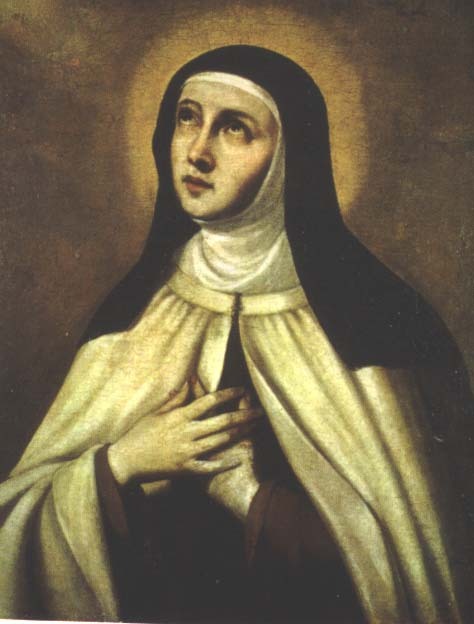 He acknowledges the question as to whether “the Council has not, in fact, taken the opposite direction to Saint Teresa, going away from true conversion of heart and moving in the direction of a conversion to worldliness on the part of the Church.” (p.6) It is a question that some would see answered clearly enough in the reaction to Dominican Sister Jane Dominic Laurel, who was recently condemned by parents of a Catholic school for explaining the Church’s teaching on sexuality in clear and measured terms, and the meagre support offered her by the local diocese. This is a disenchanted Ratzinger we are reading, a man grappling to comprehend that his conciliar hopes not matching post-conciliar reality. It is 1966, just four years after the Council opened, and barely a year after it closed, and he sees it increasingly becoming a tool for secularisation, reducing Catholicism to one -ism among many. In engaging with the world, it risks being swamped by the world. His next focus is liturgical reform, examined in the next post. This great post is one more proof that the vital process of re-evaluation of not only the Council itself but its implementation is in full swing–by the post-Conciliar generations who are gradually replacing those who reigned supreme in the now long-defunct ’60’s. I find this a most cheerful prospect and reason to thank God daily. One theology professor of mine, who had been a very liberal peritus at the Council, in time came to have a much more sober view of things and said this which I always remembered: ‘To keep the Council in perspective, it is essential to remember that, despite its high-sounding name, it was actually only a synod of western bishops–and, like all more or less local synods, should be accorded its proper place in the history of the universal Church.’ My own hope is that a future ecumenical Council will be at last truly that, and include the bishops and patriarchs of the East as well Along with a hefty dose of representatives of those younger Catholics and religious communities and fraternities of the Roman Church who support a greater fidelity to the usus antiquior, of course. Things are definitely looking up. With a heavy heart, I have to agree with your argument. The Protestant observers at the Council seemed to have far more influence than our eastern brethren (who actually share far more with us doctrinally). Recent events in eastern Europe may or may not help the rapprochement between east and west. The Russian Orthodox are now asserting their dominance to the detriment of Catholics in Crimea. However, an ascendant Moscow patriarchate will possibly frighten other Orthodox who may be happy to reinvigorate their relations with Rome. May the next council be a long time coming! If it is to be far off, then there is more chance of the Orthodox being present. Usually at councils certain categories of abbots and major religious superiors are invited to attend. That sets a precedent for heads of the new congregations to attend a council I should have thought. Their numbers may be their best argument for inclusion. 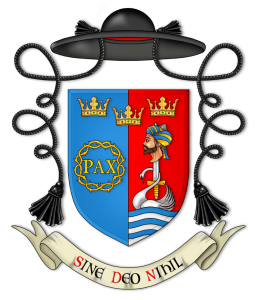 Let us be careful what we wish for: one notable and little-chronicled effect of the Second Vatican Council was due to the prolonged absence of all those in authority, bishops, abbots – tutti. By the time the voices of authority returned to their sees, monasteries etc, Catholic life had already been occupied and set alight by the modernists who had stayed at home, with the flames fanned by the Tablet journalists, the ideologues and the crypto-protestant pseudo-theologians who had spread the impression of a modernist consensus. That’s a very good point. The Council kept bishops away for long periods over 4 years, at a time when they did not have the easy, instant, international communications we have now. Nevertheless, the bishops largely acquiesced in the quiet revolution when they returned home, and by not asserting their authority early on to correct real abuses they effectively, in the eyes of the faithful, condoned it. Mind you, quite a few bishops were actively fostering it, probably in an ill-advised attempt to engage with the modern world. Thank you very much for this excellent aricle. The other day I wished to express my great concern and grief for the terrible Spanish civil war and how deeply touched I was by the tens of thousands of victims, of which many were catholic priests, bishops, deacons, religious, laiety etc. The German priest, around 56, agreed. I continued, saying that the majority of the murders of catholics were committed by the stalinists who also burnt and copmpletely destroyed thousands of churches in Spain; in Madrid, hundreds of churches in just a few weeks. The stalinists committed mass murders on catholics, outside Madrid, around an estimated 3.000 in just one day, going on for several days. Some priests and bishopos were skinned alive and/or castrated. I went home, very sad and yes, very, very upset and angry! How can any catholic priest be allowed to utter such horrendous and igorant nonsense to anyone, especially to his own parishioners?! Moreover, he has explicitly made it clear that he does not wish any special prayers whatsoever said for persecuted christians all over the world. His explanatinon: ” We should not do this, since christians are not the only ones who are suffering”. But once, in his homily, he mentioned some members of Greenpeace with great compassion, after some had been arrested by the countrie´s pólice. Dear fr Hugh, I would appreciate a comment and some advise from you., since I feel suffocated and sick whenever I think about this. And he hates dignified music at Mass. He scorns at anybody´s special gift(s) and ignores them, especially if they are academics or similar. He can only and exclusively demonstrate apreciation to all kind of mediocrity, and so called “mediocre” people. Please, I do NOT use this in a scornful way, but this is the only way I could describe his attitude. I always take great care to show love and respect to everybody, never having in mind their social status or background. Clearly, it does seem to me that this priest a very good representative for those many priests his age and above who chose to interprete the VAT II as sth leftist, to support their own leftist agenda. This priest NEVER talks about anything serious, he seems to dislike it thoroughly, but loves to engage in non stop nonsense small talk or stupid jokes, endlessly, together with the many women in his pàrish and his “housekeeper” as they express it in German, who sometimes act as if she would be the pope. He is abviously afraid of her and always let her decide..
Obviously I do not know the priest about whom you write, nor his circumstances or anything about him at all other than what you have written. So my comments must be taken with this in mind: that I am speaking in ignorance of the priest’s personal situation. That said, he exhibits many of the marks of someone who, quite simply, no longer believes in the Catholic faith. This is not uncommon among clergy in any age. Some cope by going through the motions of priestly life, and instinctively people of faith can tell something is wrong even if they cannot articulate it. Others, however, seem to be converted to a new belief system while maintaining the cover of the old. For some it is a political ideology, others a social ideology; in short, some sort of secular belief system replaces the supernatural. Your priest seems to fit into this latter category of activist crypto-apostate (for want of a better word). In short, I would recommend, from this distant vantage point and with my limited view of things where you are, that (1) you pray for this man and (2) for the time being you worship somewhere else. If you stay at this priest’s church you will expose yourself to growing frustration, confusion, anger and even hurt. Outside of praying for him, put him out of your mind. Find a church where your faith is nourished and no scandal is given. This advice could, and would, be challenged by many as inadequate, in failing to deal with the scandal this priest appears to be giving. By all means write to the bishop, but I suspect that this will not bear much fruit unless you are in a diocese which has a faithful, bold and forthright bishop. Sometimes a holy pragmatism is the better course. If everyone left this priest’s church he would soon have to face his own folly one way or the other. Brilliant, dear Father. Thank you. Too kind, and beyond my deserts, and with none of the spiritual meat you offer. But thank you. Part 2 coming soon! Can you please, please, please send me (privately, by email perhaps) the article “Catholicism After the Council”! As a young Catholic trying to understand all these things I would love to read it. Actually I was thinking scanning the article into my computer anyway since, for all sorts of reasons, it is a keeper, as they say. Moreover, I am toying with uploading it for the blog readers to consult, just as you want to do. Leave it with me and I will; get back to you on it. Did you end up scanning the article onto your computer?